For other uses, see Leinster (disambiguation). Leinster (/ˈlɛnstər/ — Irish: Laighin / Cúige Laighean — pronounced [ˈl̪ˠaːjɪnʲ]) is one of the Provinces of Ireland situated in the east of Ireland. It comprises the ancient Kingdoms of Mide, Osraige and Leinster. Following the 12th-century Norman invasion of Ireland, the historic fifths of Leinster and Mide gradually merged, mainly due to the impact of the Pale, which straddled both, thereby forming the present-day province of Leinster. The ancient kingdoms were shired into a number of counties for administrative and judicial purposes. In later centuries, local government legislation has seen further sub-division of the historic counties. Leinster has no official function for local-government purposes. However, the province is an officially recognised subdivision of Ireland. It is listed on ISO 3166-2 as one of the four provinces of Ireland and "IE-L" is attributed to Leinster as its country sub-division code. Leinster had a population of 2,630,720 according to the preliminary results of the 2016 census, making it the most populous province in the country. The traditional flag of Leinster features a golden harp on a green background. The Gaelic Kingdom of Leinster before 1171, considerably smaller than the present-day province, usually did not include certain territories such as Meath, Osraige or the Viking cities of Wexford and Dublin. The first part of the name Leinster derives from Laigin, the name of a major tribe that once inhabited the area. The latter part of the name derives either from the Irish tír or from the Old Norse staðr, both of which translate as "land" or "territory". Úgaine Mór (Hugony the Great), who supposedly built the hill-fort of Dún Ailinne, near Kilcullen in County Kildare, united the tribes of Leinster. He is a likely, but uncertain candidate as the first historical king of Laigin (Leinster) in the 7th century BC. Circa 175/185 AD, following a period of civil wars in Ireland, the legendary Cathair Mor re-founded the kingdom of Laigin. The legendary Finn Mac Cool, or Fionn mac Cumhaill, reputedly built a stronghold at the Hill of Allen, on the edge of the Bog of Allen, in what was then Leinster. In the 4th and 5th centuries AD, after Magnus Maximus had left Britain in 383 AD with his legions, leaving a power vacuum, colonists from Laigin settled in North Wales, specifically in Anglesey, Carnarvonshire and Denbighshire. In Wales some of the Leinster-Irish colonists left their name on the Llŷn Peninsula (in Gwynedd), which derives its name from Laigin. In the 5th century the emerging Uí Néill dynasties from Connacht conquered areas of Westmeath, Meath and Offaly from the Uí Enechglaiss and Uí Failge of the Laigin. Uí Néill Ard Righ attempted to exact the Boroimhe Laighean (cattle-tribute) from the Laigin from that time, in the process becoming their traditional enemies. 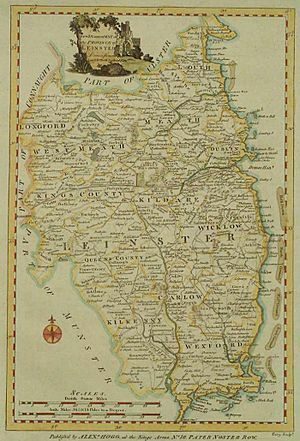 After the death of the last Kildare-based King of Laigin, Murchad Mac Dunlainge in 1042, the kingship of Leinster reverted to the Uí Cheinnselaig sept based in the south east in present-day County Wexford. This southern dynasty provided all the later Kings of Leinster. The ancient Kingdom of Mide today encompasses much of counties Meath and Westmeath with five west County Offaly baronies. The Offaly parishes of Annally and Lusmagh were formerly part of Connacht while the baronies of Ballybritt and Clonlisk were part of Éile in Munster. County Louth was formerly part of Ulster. The last major boundary changes occurred with the formation of County Wicklow (1603–1606), from lands in the north of Carlow (which previously extended to the sea) and most of southern Dublin. The provincial borders were redrawn by Cromwell for administration and military reasons. Later minor changes dealt with "islands" of one county in another. By the late 1700s, Leinster looked as shown in the above map of 1784. Leinster represents the extended "English Pale", counties controlled directly from Dublin, at the beginning of the 1600s. The other Provinces had their own regional Presidency systems, based on a Welsh model of administration, in theory if not in fact from the 1570s and 1580s up to the 1670s, and were considered separate entities. Gradually "Leinster" subsumed the term of "The Pale", as the difference between the old Pale area and the wider province, now under English administration, grew less distinct. Following the abolition of County Dublin, three successor counties were created that cover the same area. They are Dún Laoghaire–Rathdown, Fingal and South Dublin. To these may be added the historic County Corporate of the city of Dublin, which, under the terms of the Local Government (Ireland) Act 1898 was abolished to be succeeded by the County borough of Dublin. This was in turn abolished under the terms of the Local Government Act 2001 and the area is now under the jurisdiction of Dublin City Council. 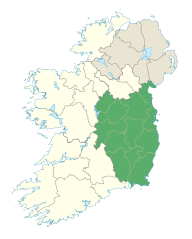 The remaining counties of the province are Kildare, Offaly, Laois, Wexford, Carlow, Wicklow, Louth, Meath, Westmeath, Longford and Kilkenny. While Kilkenny city was once a county corporate, by the terms of the 1898 Act it became part of the administrative county. although it retains the privilege of calling itself a city. As is the norm for language in Ireland, English is the primary spoken language, but there is an active Irish-speaking minority in the province. According to the Census of Ireland of 2011, there were 20,040 daily speakers of Irish in Leinster outside the education system, including 1,299 native speakers in the small Gaeltacht of Ráth Chairn. To these can be added 19,348 students attending the 66 Gaelscoils (Irish-language primary schools) and 15 Gaelcholáistí (Irish-language secondary schools) in the province, primarily in the Dublin area. A number of sporting and cultural organisations organise themselves on provincial lines, including Leinster Rugby, Leinster Cricket Union and Leinster GAA. While Leinster GAA is made-up primarily of the traditional counties of the province, GAA teams from Galway, Kerry and Antrim have played in the Leinster Senior Hurling Championship, as has a team from London. Galway won the title in 2012. Participation of these counties is based on their performances in the Christy Ring Cup from which they can be promoted from or relegated to. Leinster Facts for Kids. Kiddle Encyclopedia.